The Pause button on the Start Stop Box is dusty or damaged. Symptoms include constant pausing, and home being cancelled due to pause button (in newer versions of the software). has buttons that can become unusable due to dust buildup. This model Start Stop Box has been discontinued. 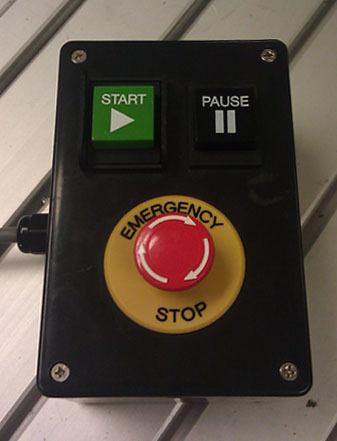 To repair the problem, Contact Support and obtain a new button or a new style Start Stop Box. Repeatedly exercise the switch aggressively. Another option is to disable the Start Stop Box in software. The emergency stop button will still work. To disable the Start Stop Box, click Setup, Advanced, Touchpad and Remote. Change the Start Stop Box mode to 0.